New work from Carla Potter, May 2012 Featured Artist at Red Lodge Clay Center. From a background of dance, Carla’s creative endeavors embrace many materials as she travels through an artist’s life. 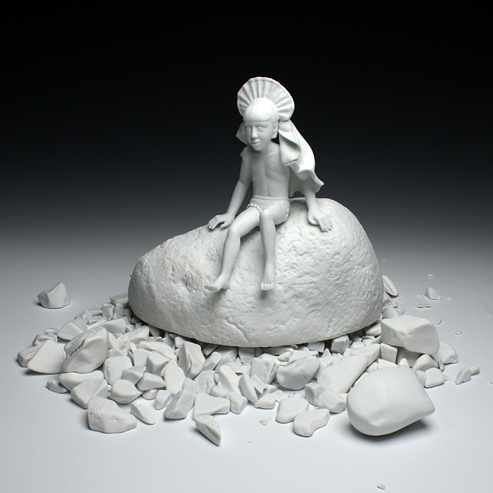 Her most recent works have presented stark white porcelain figures, visual ironies distilled to reveal only the most relevant essence of her frozen moments. With such a rich, diverse background we are excited to see what is born of her studio practice in the coming year. Will she delve further into the rich history of the figurine or will there be a new thread to pick up in the story of Carla Potter? You will have to mark your calendar and check in with us to see.